Send us your baseall & softball resources. A bat does not create swing improvements. POWERCHUTE® creates sequencing, core strength, bat speed and confidence at the plate.. Why would you purchase a $500 Bat if you don't have the swing to match it, with POWERCHUTE®, you will improve you swing metrics and batting stats without spending $500 on a bat.... Purchase a great swing that will last a lifetime. We Guarantee it!!!! with our 30 day money back policy. The PowerChute increases resistance through drag. The resistance only occurs in the downswing where you are trying to gain speed which improves neurologic adaptation. Plyometric exercise is the best way to increase power and speed. The physical demands created by the PowerChute are consistent with other plyometric exercises. The PowerChute causes a quick lengthening of the muscles responsible for initiating the downswing which is followed by a strong concentric or shortening of the same tissues. The physical demand will result in an increased quantity and quality of fast-twitch muscle fibers. That is how the PowerChute works. “It shows your body how to recruit the fast-twitch resources that enable you to swing faster”. Special YouthSportsSpot Discount : Offer good for 15% Off. 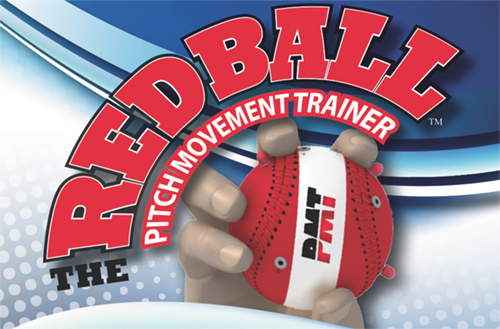 Use Code K7 at the Red Ball Pitch Movement Trainer checkout! The GloveLock™ is a brand new product in the baseball and softball world. The GloveLock™ is a small, yet strong locking mechanism that slides down on the thumb and pinkie laces to create a better fit in every ball glove -- old or new! The laces for your thumb and pinkie are there to keep your glove locked tight on your hand, but they constantly come loose and need re-tightening. Hands and wrists come in all sizes so the GloveLock allows you to lock those laces down as tight as possible and keep it there, keeping your hand tight in the glove. Letting the ball slip from a loose glove is not an option. Now you can guarantee those laces stay locked down and your hand locked in and the ball secure in your glove-- with The GloveLock™. 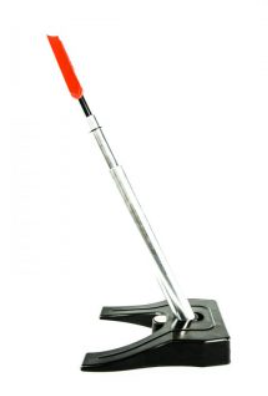 * Little league coaches; you don't have to spend any more of your time tightening your little ball player's knots or using your tools to pull those laces back out from inside the glove. * Catchers are susceptible to thumb injuries and the GloveLocks are incredible at keeping your thumb in a safer place. If you do need to use a thumb guard you can slide it right in and lock it down in an instant. 17 Colors to match your glove or your team colors. PALMGARD is celebrating its 28th year in the sporting goods industry. 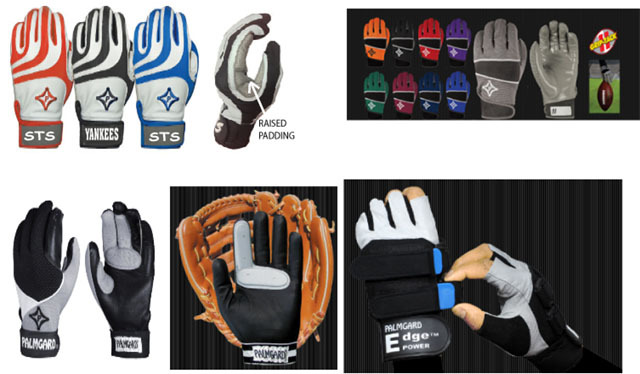 PALMGARD manufacture high quality Baseball and Football Gloves and Accessories that will allow you to perform better and longer at your game. The Edge Power Weighted Training Glove - Great for BASEBALL, SOFTBALL & FOOTBALL: Improve arm strength and bat speed with one great product. Protective Inner Glove Xtra is a protective glove specifically designed and patented for use inside baseball and softball fielding mitts. PALMGARD provides the needed protection for the critical areas of the catching hand of a ballplayer without sacrificing the player’s level of proficiency. The essential feature of the design is the shock-absorbing cushions covering the critical areas of the index finger and upper palm. The cushion consists of a non-springy material that is slow to return to its original contour and therefore reduces the rebound effect and helps retain the ball in the glove. Baseball Batting Gloves have a seamless soft digital sheepskin palm, soft lycra and synthic back with a neoprene wristband for extra comfort. GRIP-TACK II FOOTBALL RECEIVER GLOVES maintains its tack and gripability. The palm surface will not attract grass and dirt and the gloves are washable. Double stitched seams for added durabilitly. Adult sizes range from S-XXXL and Youth sizes range from XXS-L. Nine color choices are available!